This product is OEM Software. OEM software cannot be used as an upgrade; any previous or trial versions of the software must be uninstalled before installing an OEM. The packaging is installation CD & Product Key/Serial Number, no box. OEM Software does not come with installation support from the manufacturer. 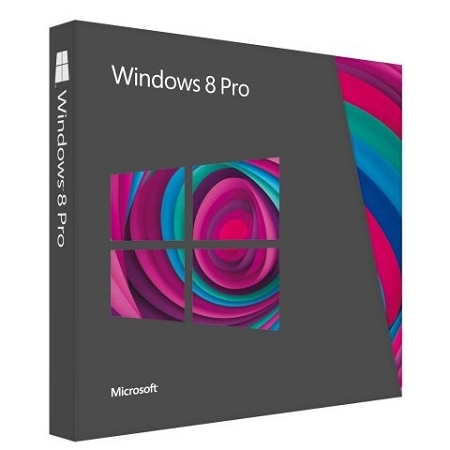 Windows 8 Pro (32- or 64-bit) from Microsoft is a complete redesign of how you interact with your computer. One of the most notable features found within Windows 8 Pro is the Start Screen. This intuitive Start Screen puts your entire computer on one screen by providing you tiles allowing you to interact with virtually every aspect of your computer from email, to chat, to applications. You can also use this same intuitive interface on a variety of devices that run Windows 8 including desktop PCs, tablets, and touch screen PCs. Cloud connectivity is another major feature found in Windows 8. Simply set up a Microsoft account, and you can access and manage various aspects of your account from any Windows 8 device. Utilize the Mail and Messaging apps to keep in touch with friends, family, and co-workers by linking to other social networking accounts such as Facebook and Twitter. You can also take advantage of Microsoft SkyDrive to upload your files making them accessible from any Windows 8 device. Along with Cloud connectivity, Apps help make Windows 8 stand alone as an intuitive, customizable operating system. SkyDrive, Xbox, Video, Music, Mail, Calendar, Photos, People, Messaging, and Reader make up the apps that come standard with Windows 8. Each of these apps helps you to get the most out of your Windows experience. With SkyDrive, you can access files virtually anywhere on a Windows 8 device. The Xbox, Video and Music apps enhance your multimedia experience helping to streamline your music, video, and games access across multiple devices including the Xbox 360. Mail, Calendar, People, and Messaging apps keep you in touch with friends and family while keeping you on schedule. Place all of your photos in one place with the Photo app, making it possible to see your photos on any Windows 8 device. The Reader app makes it possible to read a variety of different documents in PDF, XPS, and OXPS file formats. The new Start screen has all of the information you care about in one place, such contacts, the weather, and the next appointment on your calendar. Windows 8 is truly yours: websites, playlists, photo albums, contacts, and your favorite apps are front and center. The tiles on your Start screen are brimming with content, and they change and update in real time so you can see what's going on and stay on top of things. You can share and connect with other people in a couple of clicks, and get real-time updates about things like news, sports, and what your friends are up to. Check your schedule or get the latest weather forecast. Tiles are a quick way to see it all. Launch apps, switch between tasks, and check notifications without digging for information. Windows 8 also incorporates the PC desktop that you're already familiar with. In the desktop, you'll see that the settings and features you used in Windows 7 are still there. Whether browsing apps, reading a book, or typing on the go with touch, creating a project that requires the more productive horsepower of a traditional mouse and keyboard, or doing everything at once, Windows 8 makes it easy. You use whatever works best. On touch enabled PCs, you can do the same things you could with a mouse and keyboard with touch. You can switch between apps, organize your Start screen, and pan and zoom. With the touch keyboard, you can navigate, type, and interact on the go. Because you work in different ways depending on which app you're using, Windows 8 makes it easy to use whichever method works best for you. The touch keyboard has two modes designed to suit a variety of needs. Take advantage of a full-sized keyboard with large buttons, or a handy thumb keyboard that splits the keys on either side of the screen, making it easy and more comfortable to use on the go. Typing feels natural whether you're sitting down or walking around. On touch enabled PCs, the keyboard layout automatically adjusts to the language you choose for Windows, so your language settings apply to the whole PC rather than just certain apps. Whether you want to type and click, swipe and tap, or do a combination of both, you can navigate and work easily and efficiently in the language of your choice with Windows 8. Sign in and your Windows 8 device becomes yours because your personalization, desktop background, and settings are all there. Whether you set it up once just the way you want it, or change it often, when you sign in even a brand-new PC lights up with everything that makes Windows yours. And anyone you share your Windows 8 PC with can have their own personalized, cloud-connected access by signing in with their own Microsoft account. Start a project on one PC, and finish it on another. When you use the cloud to store your information, the boundaries between devices dissolve. Your apps, games, music, photos, files, and settings aren't stored on one device because they're in one place: the cloud. Sign in to any of your Windows 8 PCs and access all of your stuff from virtually anywhere. Use the mail and messaging apps to communicate with all of your friends, family, and co-workers. If you have contacts all over the place, in Outlook.com, Messenger, Facebook, Twitter, Gmail, or some other service, you can choose to connect them. Once connected that contact is then available in your apps as soon as you sign in to your PC with your Microsoft account. You can have a fully connected aulress book with the people app. Simply sign in to your Microsoft account from any Windows 8 device and you can pick up just where you left off. When your files are in the cloud and you have an Internet connection, you can access photos and other files on Microsoft SkyDrive just like you access other things on your PC, and you can get to them from any web-connected device. With Microsoft Family Safety, you can set up accounts for your children so you don't have to worry as much about their online activity. Family Safety will monitor your children's activities and let you know what they're doing. By connecting to your account, you'll be able to get weekly email reports in your inbox. You can also set up web filtering, time limits, and app restrictions. With Windows 8, your entire PC is cloud-connected. You'll have new Microsoft Mail, Calendar, SkyDrive, Photos, People, and Messaging apps that are connected to services like Facebook, LinkedIn, and Twitter just by auling them to your Microsoft account. With SkyDrive, you don't need to worry about being able to access your documents and photos on other PCs because when they're in SkyDrive, you can access them from any device with an Internet connection. The Xbox app along with the Video and Music apps put a variety of entertainment options at your fingertips. Videos you buy are available for playback on both Windows 8 and on your Xbox 360. Get access to over 15 million songs, and play back songs in your personal library, all with the Music app. You also get a variety of games on the Xbox Live Games app. Connect and play with friends, and create your own unique gamer avatar. You can even find and purchase games for your Xbox 360. Mail allows you to see all of your accounts in one place, whether it's Outlook.com, Gmail, or your company's Exchange mail. You can pin email accounts to the Start Screen so you can see your new mail on the live Mail tile without opening the Mail app. You can even pin individual folders to stay up to date. Access the SkyDrive to automatically upload files for recipients to see. Just like the Mail app, Calendar combines your information by pulling together your multiple calendars into a single day, week, or month view. You decide which of your calendars are shown, and you can adjust the colors to suit your preferences. Pinning the Calendar app to the Start screen means you see upcoming events on the tile. You can even choose to see upcoming appointments on the Windows lock screen so you won't have to unlock your PC to see what's going on. The Photos app pulls all of your pictures together into one place. So now your albums from Facebook, Flickr, SkyDrive, and all of the pictures you store on your PC are there when you connect your Microsoft account to these services. The People app is your complete aulress book. You can include contacts from Outlook.com, Messenger, Facebook, Twitter, LinkedIn, Gmail, and others. Quickly see what's new, share an update, comment, or initiate a conversation with the Messaging app. With the Messaging app on your Windows 8 PC, you can chat with Messenger or Facebook friends from one convenient place. With the Reader app, you can read PDF, XPS, or OXPS documents. You can interact with your PDFs by highlighting, auling text annotations, printing, and sharing. In Windows 8, apps work together so you can share information between them and streamline your work. The Windows Store is designed to make it easy to discover apps without getting lost. You can search or browse by category or lists of top apps to find the apps you want. You'll see apps featured on the front page and you'll have no trouble finding apps because they're organized in categories like New Releases, Top paid, Top free, and Rising stars. Using Family Safety, you can change settings to determine what your children can download and see in the Windows Store. Setting up a rating level filters the apps and games that children can access and provides a safer environment based on your preferred restrictions. It starts and loads sites almost instantly. It brings a fluid responsiveness to greatly enhance your web browsing experience. Everything you want to do on the web is a swipe, tap, or click away. Internet Explorer 10 provides a touch first and a truly full-screen browsing experience. Navigation controls appear only when you need them and quietly get out of the way when you don't. You can flip ahead or back through your websites with the flick of a finger. Tiles and tabs for frequently visited sites are oversized for easy tapping. Smooth, intuitive controls work just as you'd expect. One box is both the aulress and search bar for speedier navigation. Pin your favorite sites to your Start Screen and get to them as quickly as you access your apps. The intuitive Smart Screen technology helps keep your PC and your information safer on the web as well as helping to protect against socially-engineered malware. Privacy tools like Do Not Track are built-in and are easily enabled in just one click, giving you more control. OEM "Original Equipment Manufacturer" Software is distributed to companies like Dell, IBM & HP for installation on new machines. The main difference is that OEM can not be used as an upgrade, any previous or trial versions of the software must be uninstalled before installing an OEM. The packaging is typically CD & License, no box. OEM Software does not come with installation support from the manufacturer.